The key economic releases this week are new home sales on Tuesday and durable goods on Thursday. However, the main event in what is one of the slowest summer weeks, will be the Jackson Hole symposium starting this Friday, where focus will be on Yellen's speech who will be scrutinized to see if she can bring the Fed's message back on track after various conflicting and contradictory statements by key Fed speakers in recent weeks. The usually dovish NY Fed President Dudley caused the first bump when he said on Tuesday that a September hike was ‘possible’ and that ‘we’re edging closer towards the point in time where it will be appropriate to raise rates further’. Dudley also made the comment that he thought 10y Treasuries were ‘pretty low given the circumstances’. On the same day Atlanta Fed President Lockhart (a centrist) added that he thought at least one rate increase could be appropriate later this year. Late on Thursday we then heard from San Francisco Fed President Williams (also largely seen as a centrist) who said that every meeting should ‘be in play’, including September. The latest addition to the debate on Sunday was Fed vice chair Stanley Fischer who suggested that the Fed "are close to their targets". Although he didn't comment on when they should hike it was a generally upbeat reflection on the US economy. The main theme of the speech though was the slowdown in productivity in recent years and how monetary policy wasn't equipped to reverse the slump and that fiscal and regulatory policy were likely to be more effective. Although Fischer is known to be on the hawkish side (albeit moderately) and Yellen on the more dovish side, he probably wouldn't want his comments in the week of the Jackson Hole get together to be interpreted in a manner completely different to his boss. So this sets up an interesting Friday. Aside from Jackson Hole, it’s a quiet start to the week today with only the Chicago Fed national activity index in the US this afternoon to note of. Tuesday kicks off in Asia where we’ll get the flash manufacturing PMI reading for August in Japan and also the MNI business indicator out of China. During the European session we’ll get the August flash PMI’s for the Euro area, Germany and France (manufacturing, services and composites) along with CBI trends data for the UK. In the US we’ll also get the flash manufacturing PMI along with the Richmond Fed manufacturing index and new home sales for July. The Euro area consumer confidence reading for August will also get released. Turning to Wednesday the highlight of the morning session in Europe will likely be the final Q2 GDP revisions for Germany, along with the various subcomponent readings. The data in the US on Wednesday is focused on the housing market with existing home sales for July and the FHFA house price index reading due. With little in the way of data to note of in Asia on Thursday we’re starting in France where the August confidence indicators are due to be released. Shortly after that the IFO survey in Germany for August is due. There’s a number of important releases in the US on Thursday starting with the flash durable and capital goods order data for July, along with the remaining flash PMI’s (services and composite), initial jobless claims and the Kansas City Fed’s manufacturing index. The end of the week on Friday is a big one for data. In Japan we’ll get the July CPI report early on. German and France consumer confidence readings follow this, along with UK Q2 GDP. We then end the week in the US with the second reading of Q2 GDP and core PCE, the advance goods trade balance reading in July and the final University of Michigan consumer sentiment reading. As noted above, Friday is when the Jackson Hole symposium begins. There are no major data releases. 9:45 AM Markit Flash US Manufacturing PMI, August preliminary (consensus 53, last 52.9): Details from the Empire State and Philly Fed surveys were mostly soft in August, following mixed reports from regional manufacturing surveys in July. We find that the flash Markit PMI does contain some predictive power for the ISM. 10:00 AM New home sales, July (GS -2.9%, consensus -2.0%, last +3.5%): We expect new home sales to decline by 2.9% in July, after new home sales rose by 3.5% in June to a post-crisis high. New home sales are highly volatile on a month-to-month basis. Housing starts saw steady gains across single-family and multi-family units in July, while single-family building permits declined by 3.7%. 9:00 AM FHFA house price index, June (consensus +0.3%, last +0.2%): Consensus expects a 0.3% gain in the FHFA house price index in June, which has risen 5.6% over the past year. The FHFA house price index has a wider geographic coverage than the S&P/Case-Shiller home price index, but is based only on properties financed with conforming mortgages. 10:00 AM Existing home sales, July (consensus -0.9%, last +1.1%): Existing home sales are expected to decline by 0.9% in June, according to the consensus view. Existing home sales are an input into the brokers' commissions component of residential investment in the GDP report. 08:30 AM Initial jobless claims, week ended August 20 (GS 260k, consensus 265k, last 262k); Continuing jobless claims, week ended August 13 (consensus 2,148, last 2,175k): We expect initial jobless claims to move down a touch to 260k, near post-crisis lows. Last week, initial claims declined slightly to 262k, with the greatest decline in Michigan, likely reflecting reduced auto-related layoffs. 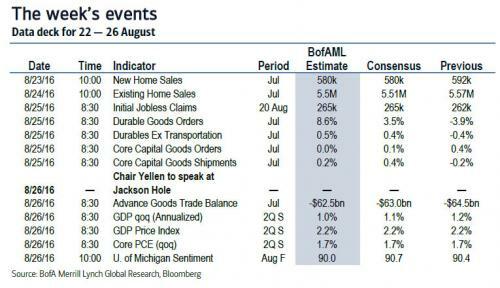 08:30 AM Durable goods orders, July (GS +2.0%, consensus +3.5%, last -3.9%); Durable goods orders ex-transportation, July (GS +0.5%, consensus +0.4%, last -0.4%); Core capital goods orders, July (GS +0.5%, consensus +0.2%, last +0.4%); Core capital goods shipments, July (GS +0.3%, consensus +0.5%, last -0.2%): We expect durable goods orders and core capital goods orders to rise 2.0% and 0.5% respectively in July, following two softer-than-expected reports previously. Last week, July industrial production data came in stronger than expected, while regional manufacturing surveys were mostly mixed. We also expect core capital goods shipments to increase 0.3%, on the back of an upbeat print in the ISM manufacturing index’s production component. Over the last year, core capital goods orders declined by 3.6%, while core capital goods shipments declined by 4.9%. 06:30 PM Kansas City Fed President George (FOMC voter) speaks: Federal Reserve Bank of Kansas City President Esther George will meet with the Center for Popular Democracy’s Fed Up campaign. Other Fed officials attending the Jackson Hole conference have been invited to attend. New U.S. Census Bureau Report on Advance Economic Indicators: Last month, the Census Bureau’s inaugural Advance Economic Indicators report showed a slightly wider trade deficit and lower inventory accumulation than we had anticipated. We expect the goods trade deficit to narrow in July. 10:00 AM University of Michigan consumer sentiment (final), August (GS 90.4, consensus 90.6, last 90.4): The Michigan consumer sentiment gauge edged up to 90.4 in the August preliminary estimate and remains within range of recent observations. We forecast the index to remain unchanged in the final estimate. 11:00 AM Fed Chair Janet Yellen (FOMC voter) speaks: Fed Chair Janet Yellen will give opening remarks at the annual Kansas City Fed symposium in Jackson Hole. The symposium’s topic this year is “Designing Resilient Monetary Policy Frameworks for the Future.” In her June 6 speech at the World Affairs Council in Philadelphia, Chair Yellen notably labeled the stance of monetary policy as “modestly accommodative”, adding some uncertainty about the characterization of policy in the FOMC statement.